What’s Your Biggest Challenge to Creating a Culture of Quality in Patient Care? The role of quality improvement in healthcare is more critical today than it ever has been. It is a top driver at any clinic or hospital system, regardless of size. It’s a major factor not only when it comes to the performance of a department or institution, but also overall patient safety. However, maintaining and improving quality is no easy task. 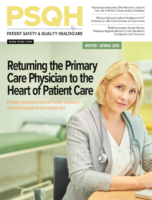 The recent 2018 Annual Patient Safety & Quality Industry Outlook showed that key issues for quality managers include the lack of technology to manage data, challenges with prioritizing and aligning projects, difficulty with demonstrating how projects contribute to strategic objectives and deliver ROI, poor visibility, the absence of a comprehensive tool set to efficiently execute projects, and getting buy-in from administrators and high-level executives. Without the validation and reinforcement of stakeholder buy-in, it’s difficult for quality initiatives to be taken seriously. But why might key stakeholders hold out, and what can you do about it? Check out the infographic below to learn more, and then see how to tackle the other two key challenges (you can also view it in full screen here). A content marketing specialist with a background in journalism, Evan McLaughlin edits The Minitab Blog and enjoys telling quality improvement professionals’ and data scientists’ stories of how they have innovated their processes to contain costs, enhance quality and improve patient experiences.